The three owners of the shuttered Sweet Leaf dispensary chain and cannabis grower in Colorado were each sentenced to one year in prison Friday for their roles in an illegal, multimillion-dollar sales scheme in what Denver officials called the first local prosecution of a legal marijuana enterprise in the United States. Matthew Aiken, Christian Johnson and Anthony Sauro each pleaded guilty to violating the Colorado Organized Crime Act, according to the Denver Post. Their plea deals stipulated one year in prison followed by one year of mandatory parole and one year of probation, to be served concurrently. The sentences culminate a cautionary tale for the industry: What can happen when a high-flying MJ business pushes the envelope and violates the spirit of the law. At the heart of the case was the practice of “looping,” in which a given customer would buy the maximum amount of marijuana allowed (an ounce) multiple times during a day. Lead prosecutor Kenneth Boyd said his team had evidence of some consumers doing this up to 40 times a day. The practice led to almost 2.5 tons of marijuana going onto the black market, authorities said. The case is unique in that Denver authorities charged a marijuana business in one of 10 states plus Washington DC that broadly allow marijuana use by adults and a commercial market to supply cannabis products. The majority of such businesses “are reputable and responsible and strive to obey our marijuana laws,” Denver District Attorney Beth McCann said in a statement. “Sweet Leaf is an exception,” she said. The case unfolded in late 2017 when more than a dozen Sweet Leaf budtenders were arrested and charged in related to police raids. The charges against the budtenders were eventually dismissed, but most of the dismissals required those charged to perform community service and make a modest payment to a charity. Last July, the city of Denver stripped Sweet Leaf of all 26 of its marijuana cultivation, processing and dispensary licenses because of the alleged illegal sales practice. Last October, Aiken, Johnson and Sauro agreed to pay $2 million in fines , stay out of Colorado’s marijuana industry for 15 years and sell Sweet Leaf’s remaining Colorado licenses. In late November, Nichole West, a former Sweet Leaf vice president, and Ashley Goldstein, an ex-retail operations manager, pleaded guilty to felony drug charges and served 30-day jail sentences in exchange for their cooperation in the case. In December, a judge issued an $8.8 million judgment against the company’s co-owners for unpaid rent, late fees and interest for breaching rules at four commercial leases. 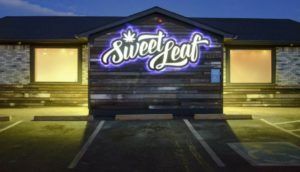 A Sweet Leaf dispensary is still listed as being open in Oregon, and Aiken, Johnson and Sauro are still listed as the owners of Sweet Leaf Portland, a limited liability company formed to operate the dispensary in the state. the provision of their sentences “to be served concurrently” is NOT in the spirit of the law. Could you explain further? Not a lawyer hence not familiar with that term. Concurrent sentences are served simultaneously. Example: parole and probation terms are 1 year each. If those terms are concurrent the terms equal 1 year total. If they were consecutive, or one after the other the total supervision would be 2 years. This story is far from over. “guilty pleas” are often just “I did not do it, but the overwhelming force of the unlimited resources of the prosecution are making me take a plea”. The people here were threatened that the US Attorney would get involved if they did not take the plea. The industry should not be quick to label these people “bad actors”. There should be no law against the amount of cannabis is sold to a customer, you don’t see that in the alcohol industry stop taking pleas grow a pair and get the laws changed by fighting the system that created this corrupt law against humankind in your constitutional courts. I agree, this cap on the amount of product sold is completely arbitrary. We all can stop at our corner liquor store and walk out with a pallet of whiskey, no prob! To take such a small rule in a 1,200-page regulation, and turn it into this media circus with crimes and all, is nothing but a stain on the city of Denver and the ‘justice system’. How are these budtenders or owners to know based on cash sales if a person has been in their store even multiple times daily? There no receipt records to show a card # for tracking so I don’t know that there’d be enough evidence to convict them of willfully committing a crime. What the city of Denver, it’s police department, and ‘justice system’ have done is a shame. The cautionary tale is that whatever business our “justice system” wants to bring down, they do. Was there a problem with Sweet Leaf’s products? Would any of the flower or edible, caused any harm to consumers? Were their properties located in a way that caused harm to the community?The answer is NO to all of the above. A normal company doing normal business. Not the best company, but neither the worst. Then what happened? One of those deep charges included in all cannabis laws that are vaguely defined, and that lead to raids, criminal charges, and this media show. The case of “looping” as it was originally stated in the law, was never defined in the terms of the lawsuit. It could’ve easily being solved by a letter and a fine. Even a visit without any SWAT team or guns. Even a phone call would’ve suffice to clarify for the dispensary the case of selling more than what the law implicitly intended. But to make the claims that it was “a multi-million dollars illegal sales scheme” come on MJBiz, enough with the reefer madness already. Saying that this lead to “2.5 tons going to the illegal market”, please. Interview and get to know the owners and employees, normal people doing normal business —until the city of Denver and their prosecutors came in with this show. Which by the way, this nonsense of “looping” is coming out of the books, so a company was destroyed based on a soon to be non-existent law. It must be tough for the incarceration industry to see weed prohibition crumble. They are desperate to retain power. They will do anything to keep their cops, prosecutors, judges and jailers busy. They can rot in hell with the slave masters and other petty tyrants of history. Concurrent sentences. When sentences run concurrently, defendants serve all the sentences at the same time.